Notable for its open weave design available in rich Carmel or Bisque finishes, this classic porch-style rocking chair fuses traditional patio aesthetics with modern outdoor performance. The deep-seated rocker was crafted from Lloyd Flanders' innovative SunLoom vinyl, which has the appearance of natural loomed wicker but offers increased durability. 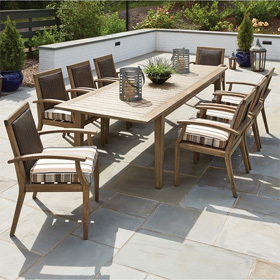 Featuring a seat cushion and fanned back, the chair will bring timeless style and superb outdoor comfort to your porch or patio space.